Rajendra Pachauri has weathered multiple storms over his 13-year tenure at the helm of the Intergovernmental Panel on Climate Change (IPCC), the United Nations' science body on climate change. The one that led to his resignation yesterday was unexpected and characterized as "sad" by his colleagues. A 29-year-old employee at a nonprofit Pachauri founded and led in New Delhi alleged this month that the scientist had sent her inappropriate emails and text messages, and allegedly sexually harassed her (ClimateWire, Feb. 19). Other women have come forward with similar complaints. Pachauri has rebutted the allegations. "Whenever someone leaves a prominent position in an organization in this way, there are question marks and there are clouds," said David Victor, a professor of international relations at the University of California, San Diego. The events are unlikely to affect talks this December when diplomats assemble in Paris to hash out a global treaty to tackle climate change, experts said. That's because the IPCC's contribution to the Paris meeting -- a report on the state of the science on climate change -- was largely completed last year. It released a summary for policymakers last November to guide the treaty process (ClimateWire, Nov. 3, 2014). But Pachauri's resignation could affect the IPCC itself, which is left without a strong leader in a year when climate science is on prominent display, Victor said. The resignation cast a pall over the meeting this week in Nairobi, Kenya, where IPCC members are deciding on the future direction of their organization. The attendees appreciate Pachauri's swift and graceful resignation, said Durwood Zaelke, president of the Institute for Governance and Sustainable Development, who was at the meeting. "The mood is respectful, resigned and professional -- let us get on with our important work, we have deadlines, and the world is depending on us," he said. For this task, the members have temporarily elected Ismail El Gizouli, a Sudanese energy expert and vice chairman of the IPCC, as acting chairman. Elections for a more permanent leader will take place in October. Colleagues described Gizouli as "quiet" and "not very outspoken." That is the antithesis of Pachauri, who has left an indelible imprint on the IPCC. He was elected to much liberal skepticism in 2002 after securing the support of President George W. Bush and winning 60 percent of the votes from member nations, as media reported at the time. 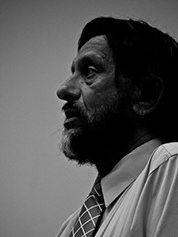 Rajendra Pachauri. Photo by Marshall Niles, courtesy of Wikipedia. Trained as an economist and industrial engineer, Pachauri was the first social scientist to helm the U.N. body. He was also the first leader from the developing world. Over his tenure, the IPCC evolved a keen focus on social science problems related to climate change. The IPCC released two major reports assessing climate science since 2002. The section, the Working Group III report, written by economists and energy modelers that evaluated the various ways the world can keep temperature rise below 2 degrees Celsius, saw the greatest maturation under Pachauri's watch. "Our role is akin to that of cartographers," Ottmar Edenhofer, an economist at the Potsdam Institute for Climate Impact Research and a lead author describing the role of social scientists, said in a statement released by the IPCC last year. "We map out different possible pathways for climate change mitigation, assess their practical consequences and trade-offs, and we clearly mark value assumptions and uncertainties." Edenhofer, who is rumored to be campaigning for Pachauri's spot, declined to be interviewed for this story. Pachauri's latest vision for the IPCC was to get the scientific body more involved in the climate treaty process. In a white paper to be considered at Nairobi, he proposed that the IPCC do an accounting of the emissions cuts that nations agree to in Paris and evaluate whether their ambition was sufficient to meet climate goals. "Such a product would be of enormous value to the global community," Pachauri wrote in a vision paper for the IPCC. His vision was remarkable because of strict guidelines for what IPCC can and cannot do. The body is run by governments, is highly bureaucratic and has clear mandates that the organization should restrict itself to policy-relevant, but not policy-prescriptive, matters. "Now, with Pachauri off the stage, I doubt the IPCC would play that role," said Richard Klein, climate policy analyst at the Stockholm Environment Institute. Instead, the IPCC would likely stick to publicizing the results of its latest report and communicating with the world, Klein said. Publicity is a role that has been Pachauri's forte since the rise of Internet blogs in the mid-2000s gave renewed vigor to skeptics who challenge the science behind man-made global warming. The IPCC and Pachauri have been targets of such attacks because of the importance of the scientific body in policymaking. Pachauri's response to such attacks define his legacy, colleagues said. In 2007, the IPCC mistakenly claimed that the Himalayan glaciers would melt by 2035. The organization, under Pachauri's leadership, dealt with the problem after initial gaffes and quickly did an independent review of its procedures. It emerged from the process with its credibility relatively unscathed, Victor of UC San Diego said. In 2007, the IPCC, Pachauri and former Vice President Al Gore received the Nobel Peace Prize for their climate efforts. Klein at the Stockholm Institute praised Pachauri's leadership during the 2009 Climategate scandal, where hackers released private emails from climate scientists and placed them out of context to suggest scientists were perpetrating a global warming hoax. The IPCC was indirectly implicated, as some of the scientists were IPCC authors. In 2010, the IPCC set up the InterAcademy Council to place a microscope on its workings, and the council cleared it of all wrongdoing. The council also made recommendations to strengthen the organization's procedures, which were fully adopted, Klein said. "The collaboration between U.N. headquarters, between Secretary-General Ban Ki-moon and Pachauri, has always been very good and based on mutual respect and trust," Klein said. "Pachauri felt very strongly that the IPCC had nothing to hide." The end product of his tenure is a strong, resilient IPCC that can survive Pachauri's sudden resignation, said Jean-Pascal van Ypersele, vice chairman of the IPCC and a climatologist at Université catholique de Louvain in Belgium. "The IPCC is 27 years old and has very robust procedures, refined over time to produce the best, policy-relevant assessments of all scientific aspects related to climate change," he wrote in an email. "Those procedures allow this organization to be very resilient and to continue its work efficiently." Ypersele is campaigning for Pachauri's seat and said that he will be meeting governments and stakeholders until elections in October. Other candidates are rumored to be Edenhofer at Postdam; Chris Field, an ecologist at the Carnegie Institution for Science in the United States; South Korea's Hoesung Lee, an energy economist who was described as a less academic and a more political choice; Austria's Nebojsa Nakicenovic, an energy economist at the International Institute for Applied Systems Analysis; and Switzerland's Thomas Stocker, a climate scientist at the University of Bern. "All of us who have been involved in the IPCC hope there are strong candidates," Robert Stavins, an economist at Harvard University, wrote in an email. "The IPCC faces its own challenges and there are a variety of areas in which an innovative and creative new Chair can lead efforts to make the needed improvements." As for Pachauri, he could not travel this week to the Nairobi meeting to discuss the future direction of the IPCC due to the sexual harrassment allegations. He has also taken a leave of absence from the nonprofit, the Energy and Research Institute, that he heads in New Delhi. In a letter to the United Nations' Ban, he said that the IPCC deserves the full attention of its chairman. "The IPCC needs strong leadership and dedication of time and full attention by the Chair in the immediate future, which under current circumstances I may be unable to provide, as shown by my inability to travel to chair the plenary session of the Panel this week," he wrote. He would continue to labor to protect the planet, he wrote in his typical style. "For me the protection of Planet Earth, the survival of all species and sustainability of our ecosystems is more than a mission," he wrote. "It is my religion and my dharma [duty]."